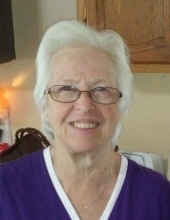 Vella Vernell Beall, age 69, of Frederick, died Friday, April 5, 2019, surrounded by loving family at Kline Hospice House, near New Market. Born July 24, 1949 in Montgomery County, she was the daughter of the late Mack Henry Seal Sr. and Pearl Irene Mathis Seal. She was the wife of Robert Reese Beall who died in 2012. Vella enjoyed gardening, cooking, her family and especially feeding her family and friends. She is survived by children, Pearl Eanes and husband Mark and Rebecca “Becky” Baker and boyfriend Bobby C., all of Frederick and Robert “Bobby” Beall Jr. and fiancée Stacey Jones of Taneytown; 8 grandchildren, Ashley, Brody, Sierra, Savannah, Dylan, Abri, Jeremy and Alexis; brothers, Jerry Seal and wife Brenda of Damascus, Charlie Seal of Tennessee and David Seal and wife Shirley of Virginia; sisters, Myrtle Loun and husband “Tookie” of Mt. Airy, Ida Mae Beeumas of Oregon, Betty Turner and Jewel Miller and husband Donald, all of Tennessee, and numerous nieces and nephews. She will be missed by many friends, including Gary and Sharon Martin and Judy Eanes. She was predeceased by sisters, Cordie Lee Barnard and Dorothy Halterman and brother, Mack H. Seal Jr.
A funeral service will be held at 11 a.m. on Wednesday, April 10 at Hartzler Funeral Home-Libertytown, 11802 Liberty Rd., Frederick, with Pastor Roger Rich, of Lakeview Church, New Market, officiating. The family will receive friends at the funeral home 2-4 and 6-8 p.m. on Tuesday, April 9. In lieu of flowers, memorial contributions may be made to Kline Hospice House, P.O. Box 1799, Frederick, MD 21701. To send flowers or a remembrance gift to the family of Vella V. Beall, please visit our Tribute Store. "Email Address" would like to share the life celebration of Vella V. Beall. Click on the "link" to go to share a favorite memory or leave a condolence message for the family.